گینٱ یاٛ گئل ڤولاتٱ کاٛ ها شومال ٱفتۉنشین هومپیڤٱند آفریقا و پاتٱخت ای ڤولات شٱر کۊناکری ٱ. 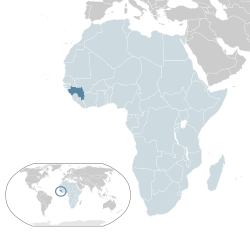 ↑ "Nations Online: Guinea – Republic of Guinea – West Africa". Nations Online. Archived from the original on 3 May 2003. http://www.nationsonline.org/oneworld/guinea.htm. Retrieved 25 August 2014. ↑ ۳٫۰ ۳٫۱ ۳٫۲ ۳٫۳ "Guinea". International Monetary Fund. http://www.imf.org/external/pubs/ft/weo/2017/02/weodata/weorept.aspx?pr.x=20&pr.y=6&sy=2015&ey=2022&scsm=1&ssd=1&sort=country&ds=.&br=1&c=656&s=NGDPD%2CPPPGDP%2CNGDPDPC%2CPPPPC&grp=0&a=. Retrieved 18 April 2012. د نۊ زنٱ بیٱ د"https://lrc.wikipedia.org/w/index.php?title=گینٱ&oldid=90118"
اؽ بٱلگٱ ایسنؽا آلشت بیٱ د ‏۹ ماٛی ۲۰۱۸، د ‏۱۲:۴۷.